If you a looking for a ready-made web solution for your flooring firm, or a construction or architecture company of any kind, or maintenance services (like roofing, plumbing, carpentry, remodeling or decorating), ThemeREX has crafted Mahogany, whose layout includes anything you might need to present your firm to your potential clients. 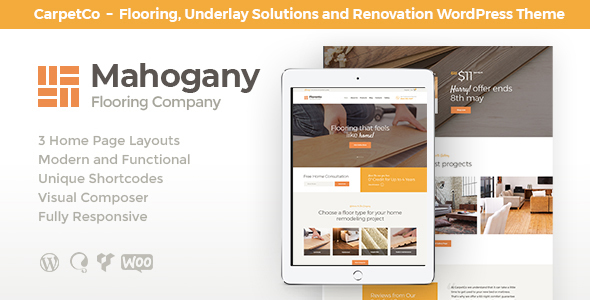 Mahogany is 100% responsive and Retina ready so no worries about how your website looks on each of the devices. To showcase your works and projects, you will find a variety of gallery layouts at your disposal. We made the theme WooCommerce ready, so building an online store of floor tools and equipment shouldnâ€™t take you much time and efforts. Do not miss a chance to give an exposure to your business with our new WordPress theme!